A drug can have many effects. Each effect is characterized by its intensity and its duration. The beneficial or toxic effects of an active principle has an intensity which depends on the administered dose and consequently on its plasma or tissue concentration. 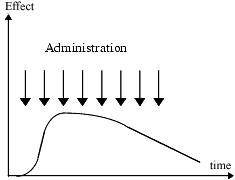 If one traces a dose-response curve, the dose being expressed in logarithmic scale, one obtains a sigmoid curve which shows that until a certain dose no effect appears (AB) then the effect increases with the dose (BD) until reaching a maximum effect or plateau (E). The dose which gives 50% of the maximum effect is called effective dose 50 (ED 50). The allergic and anaphylactic accidents are considered as not dose-related. The expression “not dose-related” means that in a person sensitized to a compound an accident can occur with a very little dose, for example an anaphylactic shock just at the onset of an intravenous infusion. 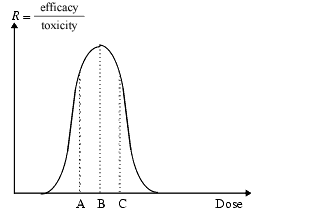 Actually, these accidents are also dose-related, but occur in sensitized subjects with doses considered as normal for non allergic persons, but it is possible to reduce the dose in such a way that even the sensitized person do not react to it: it is the principle of allergic explorations where one begins with doses extremely low. The homeopathic treatment (Hahnemann, 1755-1843) appears as an exception to this general rule that to act a drug must be present throughout the body. Indeed, according to the law of infinitesimal dilutions, the homeopathic remedies are effective with “infinite” dilutions where, theoretically, they do not contain any molecule of the initial compound. The homeopaths admit that the starting compound has transmitted certain special properties to the solvent which is said to be “dynamized”. For example, a 15CH preparation (15th Centesimal Hahnemann) corresponds to a factor of dilution of 1/10 to the power of 30 and does not contain any molecule of the starting compound. 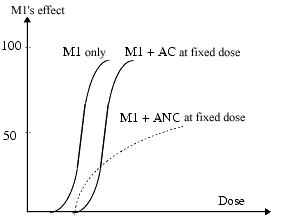 M2 is less effective than M1 but by increasing the dose, an identical maximum effect is obtained. When two drugs M1 and m2 give parallel curves, they are considered as acting by a similar mechanism. The proof of the existence of a similar mechanism of action can be obtained by the use of specific antagonists. The choice between M1 and M2 will depend on the efficacy-tolerance ratio of each one. M1 will be used at lower doses that M2 to obtain the same effect but if M2 is better tolerated, it can be preferred to M1. 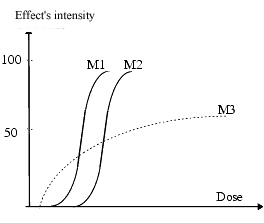 M3 begins to act at small dose but the effect increases little when the dose increases and the maximum effect obtained is lower than that of M1 or m2. It is obvious that this type of curves is obtained in animals or on isolated organs because in humans it is generally difficult to reach without risk the dose giving the maximum effect and to repeat the administrations in order to obtain the points necessary to plot curves. 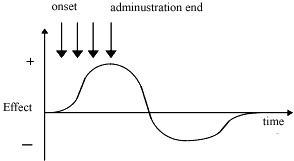 Dose-effect curves are modified in the presence of antagonists. One calls antagonist any compound which decreases or suppresses one or many effects of another molecule. 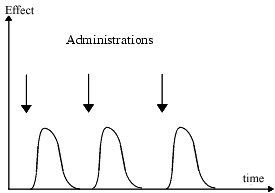 In the presence of an antagonist, the dose-response curve is either simply shifted or modified. In this type of experiment, the antagonist is present at a fixed concentration. If the effects of increased doses of the agonist M1, in the presence of the antagonist, give a shift of the curve which remains parallel to that of M1 - the antagonist is competitive, curve D1 + CA, if the aspect of the curve is modified but not parallel to that of D1, curve D1 + NCA, - the antagonist is non competitive. Both, competitive and non competitive antagonists reduce the intensity of the agonist effect. In practice this type of curves are not used, but quantitative methods adapted from enzymology. Often, the same molecule has, beside its main effect, other effects. For example, an antihistamine can have a sedative effect; a tricyclic antidepressant an atropinic effect not necessary for the antidepressant effect. When the same drug has two or several different effects, they can be obtained with identical or different doses or concentrations. 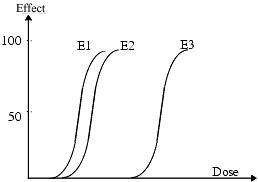 If a drug has two effects E1 and E2: if E1 is a desired effect and E2 an undesirable effect, any good effect E1 will be accompanied by the undesirable effect E2, because they are obtained at the same concentrations. It is the case of the majority of anticancer drugs whose beneficial and adverse effects coexist. If a drug has a beneficial effect E1 and an adverse effect E3, the beneficial effect E1 should not be accompanied by the adverse effect E3, which appears only at very high doses. It is the case of acetaminophen which gives a serious hepatic damage only at doses much higher than those used in normal conditions. Frequently, the time to the onset on the effect depends on the route of administration. For example, an adrenergic antagonist gives an immediate fall of blood pressure after intravenous administration but this fall is delayed after oral administration. 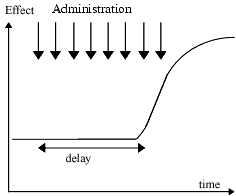 This delay has a pharmacokinetic origin, it corresponds to the time necessary for the drug to reach its targets. Sometimes the apparent effect is delayed whatever the route of administration. In general, in this case, the delay has not a pharmacokinetic but a pharmacodynamic origin, drug reaches its targets but the effect does not appear immediately. It is the case of the tricyclic antidepressants: even after intravenous administration, their antidepressant effect appears only after one to three weeks of daily administration. Generally, the effect of a drug persists as long as the drug or its active metabolite is present in the body at a sufficient concentration. In certain cases, the effect of a drug persists whereas itself or its active metabolite are not any more detected in blood but are present in certain sites. They are generally drugs which inhibit irreversibly certain enzymes and their effect lasts until the renewal of the enzyme. It is the case of proton pump inhibitors like omeprazole, certain monoamine oxidase inhibitors. It is also the case of aspirin which inhibits platelet cyclooxygenases by irreversible acetylation; it is necessary to await the renewal of the blood platelets to find the initial activity. 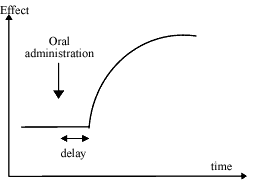 Generally, one seeks to obtain drugs having a long duration effect - possibly by sustained-release preparations – for reducing the frequency of their administration. However, which is usually an advantage can become a disadvantage when a drug causes a serious adverse effect because it is not possible to stop rapidly its effects. When a drug is stopped under good conditions, after patient recovery, the effects related to its discontinuation are negligible or unperceivable. When an effective agent is stopped too early, there is persistence or aggravation of the treated disease. When a drug, at the origin of an adverse effect more severe than the disease itself, is stopped, an improvement of the state of the patient is observed. When the cessation of a drug induces an exacerbation of certain symptoms, the phenomenon is called rebound. The discontinuation of certain antihypertensive drugs can induce a rise of blood pressure to values higher than before treatment. psychic addiction, also called dependence, which is the desire or the imperative need to continue to take the drug to find the feelings that it gives. physical addiction or withdrawal syndrome, characterized by the advent of physical complaints sometimes extremely marked and generally opposed to those given by the drug stopped. These reactions are explained by the rupture of the established equilibrium: the body by defence mechanisms tries to reduce the effects of the drug whose brutal discontinuation creates a transient imbalance, in opposite direction. Thus, the brutal discontinuation of a sedating drug can induce a transient state of excitement, and even seizures. Morphine gives a myosis, its discontinuation after prolonged use in high doses gives a mydriasis. The intensity of psychic and physical addiction, depends on the product used and is all the more important as the quantity taken was high, the duration of consumption was long and that the half-life of the product short because it is the fast decrease of its concentration in the body which causes the addiction state. The resumption of the product makes disappear the withdrawal syndrome. When the intake of a product B chemically different from a product A, suppresses the addiction to A, the phenomenon is called cross addiction. The use of methadone in the place of morphine in is an example of cross addiction. The administration of an antagonist of the addictive compound, like naloxone to a morphine addict, induces an immediate craving. The mechanisms at the origin of the addiction are complex. The compounds eliciting a physical dependence act at the level of the Locus ceruleus by inhibiting adenylcyclase, which decreases the cyclic adenosine monophosphate concentration (cAMP). After the brutal discontinuation of the intake, i.e. the suppression of the inhibition, the compensatory mechanisms which are activated, induce a hyperstimulation of the neurons of the Locus ceruleus. The compounds inducing a psychic addiction act on the mesolimbic dopaminergic system which is projected on the Nucleus accumbens. Dopamine plays a dominating role in the mechanisms of reward. The advent of a state of addiction depends on the individuals: some have a particular vulnerability and can become dependant at the first intake whereas others do not become dependant or even have a reaction of aversion. This particular susceptibility depends on genetic and environmental factors. The stress, probably via the release of glucocorticoids, contributes to the installation of addiction. To the concept of addiction it is necessary to oppose the concept of repulsion or aversion. If an animal has the choice between a beverage containing chlorpromazine and another only water, he will prefer water. If it has the choice between a beverage containing cocaine and another water, it is able to consume cocaine until death. The effect of the same drug administered repeatedly at the same dose and under the same conditions can remain unchanged, decrease or increase. It is the most frequent case: the effect of the drug remains identical when it is given repeatedly. When the effect of a drug decreases at each successive administration, the phenomenon is called tachyphylaxis. Tachyphylaxis evokes the release and the progressive exhaustion of the stores of an endogenous active product released by the drug; it is the case, for example, of ephedrine which releases catecholamines. 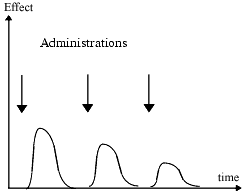 When the effect obtained decrease during a chronic administration, the phenomenon is called tolerance, for example tolerance to morphine in an addict who uses increasing doses to compensate for the loss of effect. It should be noticed that the word tolerance can be used in a different meaning: that of absence of harmful effect and one speaks about good tolerance. This case is rather exceptional and results in general from the accumulation of drug throughout the body because for example of the saturation of a process of inactivation. As generally the increase in the doses increases at the same time efficacy and toxicity, it is necessary to take account of the efficacy / toxicity ratio according to the dose. 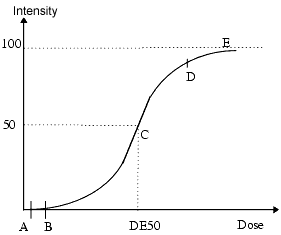 This curve shows that there exists an optimum dose. 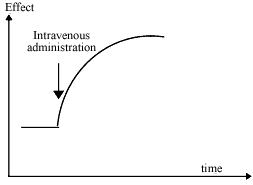 In clinical pharmacology, it is difficult to plot such curves, but the concern of prescribing the minimum effective dose must be always present. The figure above shows that in small dose, lower than A, the drug is not very effective and at a dose higher than C it becomes toxic. The optimum is between A and C.
Actually there exist differences in responses to drugs according to the individuals; when these differences are slight, they are neglected; when they are sufficiently important to have detectable consequences in patients, one must take them into account. The interindividual differences are either of pharmacocinetic origin and are related to differences in metabolism of drugs (absorption, biotransformations, elimination) which leads to different concentrations at the level of the targets, or of pharmacodynamic origin resulting from different responses of the targets to similar concentrations. These interindividual differences are generally based on differences in the structure and activity of proteins implicated either in the metabolism of drugs, or in the activity on the targets. These differences can be acquired and are of environmental type (disease, ageing, alcoholism, smoking, drug-addiction etc…) or constitutive of the individual and are of genetic origin and possibly transmissible to the offspring. The part of the pharmacology which studies the genetic differences in drug effect and metabolism is called pharmacogenetics and pharmacogenomics. There exist many examples of genetic differences in pharmacokinetics, such as hydrolysis of succinylcholine by butyrylcholinesterase, acetylation of isoniazid by N-acetyltransferases, oxidation of drugs by the P-450 cytochromes, methylation of 6-mercaptopurine by thiopurine S-methyltransferase. Among the genetic differences in pharmacodynamics, one can quote insulin resistance, sensitivity to arrhythmogenic effects in people with electrocardiographic long-QT syndrome. The knowledge of these differences, acquired or constitutive, of pharmacokinetic or pharmacodynamic types can be useful to choose a drug and adapt its dosage.